Alekseenko, Z., Andersson, E. and Dias, J. M. (2015). Chick Neural Tube Explant Culture. Bio-protocol 5(19): e1608. DOI: 10.21769/BioProtoc.1608. 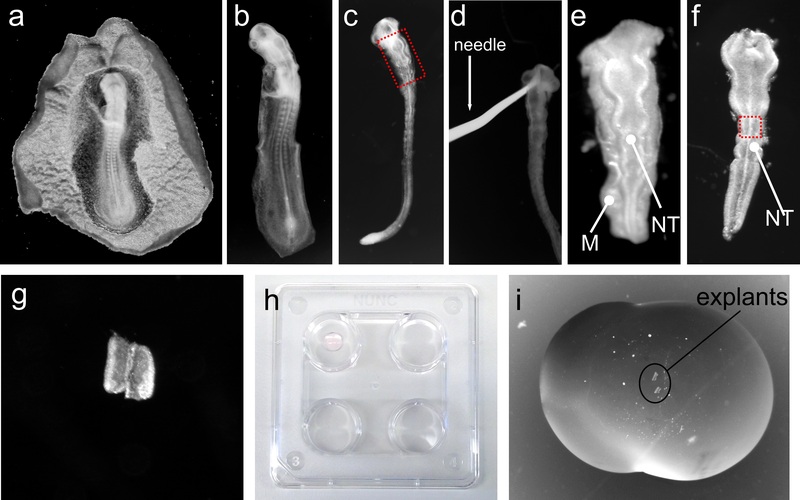 The neural tube explant culture technique allows in vitro culturing of small pieces of neural tissue isolated from e.g., chick or mouse embryonic tissue in a matrix of collagen for defined periods of time. This method can be used to study the effects of defined molecules on developmental processes such as neural progenitor proliferation and neuronal differentiation and/or survival. Since the explant material can also be prepared from embryonic tissue electroporated with expression vectors, this technique can be adapted to study gene function in the presence of specific environmental signals. Different regions of the neural tube can also be isolated during the dissection step, allowing specific regions of the neural tube to be studied separately. Here, we present a neural tube explant culture method that we have used in several studies (Dias et al., 2014; Lek et al., 2010; Vallstedt et al., 2005). Note: Currently, it is “Thermo Fisher Scientific, GibcoTM, catalog number: 11415-049”. Note: Currently, it is “Thermo Fisher Scientific, Gibco™, catalog number: 10106-169 ”. Note: Currently, it is “Thermo Fisher Scientific, GibcoTM, catalog number: 25080”. Note: Currently, it is “Thermo Fisher Scientific, GibcoTM, catalog number: 31331-028”. Note: Currently, it is “Thermo Fisher Scientific, GibcoTM, catalog number: 21103-049”. Note: Currently, it is “Thermo Fisher Scientific, GibcoTM, catalog number: 35050-038”. Note: Currently, it is “Thermo Fisher Scientific, GibcoTM, catalog number: 17502-048”. Store fertilized eggs at 16 °C (up to a week) until start of the experiment. Place eggs horizontally and incubate in a humidified chamber at 38 °C until they reach the desired Hamburger-Hamilton (HH) embryonic stage (Hamburger and Hamilton, 1992). We have used this protocol successfully with chick embryos from embryonic stages HH10-25. Make a hole in the pole region of the egg and remove approximately 5 ml of albumin (egg white) using a 10 ml syringe-needle to lower down the embryo inside the egg. Cut an oval window on the top of the egg using dissection scissors. Remove the embryo from the egg. Use a pair of tweezers to hold the membrane near the embryo and dissection scissors to cut the membrane around the embryo (see Video 1 for steps A3-5). Transfer the embryo with attached membranes into a 10 cm Petri dish on ice containing cold L-15 medium. Remove embryos from all incubated eggs before proceeding to embryo dissection. Place the Petri dish containing the embryos under a dissection microscope, remove the membranes surrounding the embryos using tweezers and a dissection micro-scissor (Figure 1a-b) and transfer them to new cold L-15 medium on ice with a transfer pipette. Somite-stage the embryos and keep embryos of the desired developmental stage (Hamburger and Hamilton, 1992). Note: From this point onwards, all dissection steps of the embryonic tissue will be performed at RT under dissection microscope. Place an embryo in a Petri dish containing ice-cold L-15 medium. With a straight tungsten needle keep the embryo immobilized and with a hook-shaped tungsten needle remove as much mesenchyme as possible without damaging the neural tube (see Figure 1b-d). Cut the region of the neural tube of interest (e.g., Figure 1e) using the hook-shaped needle and transfer the neural tube piece to a four-well plate on ice containing L15 medium using a glass Pasteur pipette. Repeat steps B1-2 to remaining embryos, one at the time. If suitable, can be pooled to the same well on the four-well plate. Pull borosilicate glass capillaries using a micropipette puller and cut the tip of the needle with tweezers. Typically, a tip of approximately 0.5 mm in diameter allows an easy manipulation of the dissected tissue (explant). Using a four-well plate prepare a Dispase I solution well, a 10% FBS/L-15 solution well, and two L-15 medium wells (washing wells). Use a volume of solution sufficient to cover the dissected tissue (500 µl of solution per well is usually sufficient). Keep at room-temperature (RT). Transfer the dissected embryos from step B with a glass Pasteur pipette sequentially through the four wells with an incubation period of 5 min/well at RT. Keep the tissue in the last washing well and place it on ice. Do not incubate the tissue in the Dispase I solution for more than 5 min. Coat two 10 cm Petri dishes with ~2 ml of FBS and incubate for 2 min at RT. Remove FBS and add ice-cold L-15 medium. Keep dishes on ice. Transfer one tissue piece to the coated Petri dish and remove the remaining mesenchymal tissue attached to the neural tube using the tungsten needles. Use a straight-shaped needle to hold the tissue and the hook-shaped needle to remove the remaining mesenchyme. Once all mesenchyme is removed the tissue should look “shiny” and smooth (see Figure 1f). Use the hook-shaped tungsten needle to cut the desired region of the neural tube to be cultured (e.g., ventral midline, Figure 1g, intermediate or dorsal region of the neural tube). Transfer the dissected tissue (explant) with a glass capillary (prepared in step C1) in a mouth aspirator tube to a four-well plate coated with FBS and containing L-15 medium (~600 µl) on ice. Change to a new coated Petri dish after every second tissue dissection to make sure the media in the Petri dish is always cold. Prepare the bedding solution according to Recipes. Add a 16 µl drop to the bottom of the wells of a four-well plate. Incubate in a humidified tissue culture incubator at 37 °C for 25-30 min, until the bubble becomes slightly “milky” white (Figure 1h, top left well). Add 2 drops of ~50 µl of bedding solution to the lid of a 10 cm Petri dish. Wash the explants by transferring them with a glass capillary in a mouth aspirator tube from one drop of bedding to the other. Add ~20 µl of bedding solution on top of the dried bedding drop from step D2 and transfer the washed explants from step D3 to the new drop of bedding. The explant will sink to the top of the dried drop. Position the explant using the tungsten needles (see Figure 1i). Incubate ~30-60 min in a humidified tissue culture incubator at 37 °C until the bedding drop hardens. Add 650 µl/well of growing medium and incubate at 37 °C. Soluble factors can be added at any time to the growing medium according to experimental setup. Culture the explants for the desired period of time according to the experimental setup. Figure 1. Representative images of different steps of chick neural tube explant technique. a. Chick embryo isolated from egg; b. Chick embryo isolated from surrounding membranes; c. Chick embryo after “raw” dissection step; d. Tungsten needle holding “raw” dissected embryo; e. Dissected hindbrain region of the neural tube of embryo shown in c; Boxed region in c corresponds to the region shown in e; f. Neural tube after fine dissection of neural tube shown in e. Note that the mesenchyme (M) surrounding the neural tube (NT) in e is now completely removed; g. Isolated ventral region neural tube, corresponding approximately to the boxed region in f; h. 4-well plate containing a bubble of collagen on top left well; i. Bubble of collagen containing 2 isolated explants of the neural tube. Note: This solution should be freshly prepared. Funding for this work was provided by Cancerfonden and Karolinska Institutet. This protocol was adapted from procedures published in Vallstedt et al. (2005) and Dias et al. (2014). Dias, J. M., Alekseenko, Z., Applequist, J. M. and Ericson, J. (2014). Tgfbeta signaling regulates temporal neurogenesis and potency of neural stem cells in the CNS. Neuron 84(5): 927-939. Hamburger, V. and Hamilton, H. L. (1992). A series of normal stages in the development of the chick embryo. 1951. Dev Dyn 195(4): 231-272. Lek, M., Dias, J. M., Marklund, U., Uhde, C. W., Kurdija, S., Lei, Q., Sussel, L., Rubenstein, J. L., Matise, M. P., Arnold, H. H., Jessell, T. M. and Ericson, J. (2010). A homeodomain feedback circuit underlies step-function interpretation of a Shh morphogen gradient during ventral neural patterning. Development 137(23): 4051-4060. Vallstedt, A., Klos, J. M. and Ericson, J. (2005). Multiple dorsoventral origins of oligodendrocyte generation in the spinal cord and hindbrain. Neuron 45(1): 55-67. How to cite: Alekseenko, Z., Andersson, E. and Dias, J. M. (2015). Chick Neural Tube Explant Culture. Bio-protocol 5(19): e1608. DOI: 10.21769/BioProtoc.1608.